Someone said -“One should not attend even the end of the world without a good breakfast.”So that implies how important the first meal of the day is! But in the hurry and worry filled world that we live in now, makes it the least important meal! But the fact is that research proves that skipping breakfast can fatten us! Now that is shocking and this gives us all the more reasons not to skip our breakfast. After hopping around various countries across the globe for breakfast this week, I am bringing you back to India to savor a simple South Indian breakfast. We South Indians ,like the rest of the world,have a whole list of breakfast dishes that might run to pages!! !Starting from the humble Idli, Dosa, Uthappam, to Pongal, Upma,Kichidi,Poori, Kanji[porridge] each of these dishes have 100’s of varieties with each one varying from family to family!! In any function or marriages the breakfast and dinner will carry majority of these dishes along with a few other dishes from the North. The ones that are always present are Idli and dosa in one form or the other. I thought I will make another simple platter for breakfast putting together 3 popular dishes from the list of South Indian Breakfast,esp, Tamilnadu,for the 5th day of Blogging Marathon #56 .And those are Idli, Vadai and Dosai. 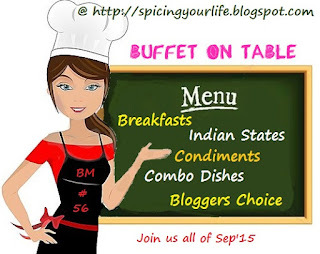 You can take a look at the Kongunad breakfast platter to get a taste of dishes from my part of the world. Vendhaya Idli – Fluffy Idlis made by grinding together a mixture of rice and fenugreek. Yes, you read it right!The usual addition – Urad dal is not used here.Yet these Idlis are spongy and so good to eat! Vegetable Vadai – Finely chopped vegetables are added to the regular vadai batter and deep fried. Mint Chutney – A delicious side with a minty flavor .A perfect side for any South Indian Breakfast Dish. Tiffin Sambar– Unlike the regular sambar this is a little different.Moong dal is used here instead of toor dal and with a just a hint of tamarind and sometimes tamarind might not even be added. Also the consistency is a lot thinner than the sambar which we have with steamed rice. South Indian Filter Kapi – No meal is complete without this beverage! Call it Kapi or Coffee it is a must with a breakfast. I dont mind inviting myself to your place to enjoy this super delicious breakfast thali..especially those vadas are too good. This is one platter that I can have for breakfast, lunch and dinner…best cuisine and very well presented. That is a beautiful spread of Tamil Nadu breakfast with a twist. I would love to eat that ,for me not so simple ,breakfast anytime.Very well presented. That's a delicious spread PJ, can't wait to check out each of them! Most comforting dish .. Each dish looks absolutely delicious. What a delicious Kongunad breakfast spread. Very inviting. A delicious platter. Love the kapi glass and katori. That's not a simple platter. Your spread stands for the essence of a south Indian breakfast platter. An idli sounds interesting. And that vendhaya idli version sounds interesting, I meant.